» Reviewed by David L. Vineyard: LOUIS JOSEPH VANCE – Terence O’Rourke, Gentleman Adventurer. Reviewed by David L. Vineyard: LOUIS JOSEPH VANCE – Terence O’Rourke, Gentleman Adventurer. In 1904, ten years before he would pen the first adventure of Michael Lanyard, the Lone Wolf, Louis Joseph Vance was concerned with the adventures of another American in Paris, Colonel Terence O’Rourke, an American soldier of fortune, down on his luck and about to face a change of fortune. In short order he pawns a watch presented to him for bravery in a South American revolution, finds a casino, loses every penny, is challenged to a duel, pursued by a mob, and leaps into a carriage to escape — where he meets a beautiful woman, Beatrix, the Madame la Princess de Grandilieu, and by sheer luck — the kind of thing that was always happening to adventurers like ‘the O’Rourke’ — utters the secret password that leads her to believe he is the man she is supposed to meet. In the hands at a romancer like Vance, that’s all that is needed. O’Rourke learns her brother has plans to lead an army into the Sahara and make himself an emperor of the wastes… There is only one problem with his plan. The Emperor is a coward and a fool, known as ‘le petit Lemercier,’ the laughing stock of France for his foolish exploits. A grand scheme, one O’Rourke would likely by pass though if not for the beautiful Beatrix. He teams up with Daniel ‘Danny’ Mahone, once his batman, and takes command of the army of the Emperor of the Sahara. But no one asked the local nomadic bandits the Tawareks (Tuaregs). “They are the lords of the desert — inhabitants of the Sahara proper — a branch of the Berbers: perhaps the root-stock of the Berber family tree… They infest the caravan routes: in a word, they’re pirates, and rule the country with a rod of iron. O’Rourke fired again, almost at random, risking everything, even the woman he loved, in the necessity of saving her from what was, if not death itself, worse than death. … her husband Prince Felix dies, and O’Rourke rescues the lady and leads a desperate battle, and bloody retreat. But he doesn’t get the girl. After all, she is a princess and he is a penniless adventurer — besides, his adventures were just beginning. Two sets of them flowed from Vance’s capable pen. O’Rourke adventured in the pages of The Popular Magazine where he wielded his sword and Mauser with deadly skill. After “The Empire of Illusion,” the series of stories which make up the tale comprising the first half of the book, he finds himself in a Ruritainian adventure rescuing a kidnapped prince and dueling an evil prince. After that he is discovered preventing a revolt against the British in Egypt. Always his fist, his sword, and his gun are quick to be employed in a good cause; always he just fails to make enough to reclaim his true loves hand; always he finds a new adventure. Beatrix, bless her, would have him anyway, but O’Rourke will not impoverish her. He’ll have a fortune for her or die trying. And he frequently comes perilously close to doing just that. Not that he is averse to other beautiful women. He’s loyal, not dead. Eventually he inherits one of those convenient fortunes from one of those equally convenient relatives that die and leave such fortunes in tales of adventure and romance, battles a deadly Duke on a vertiginous stairway, and sends him to hell through a doorway that leads only to a precipitous plunge a la David Balfour’s near fate in Kidnapped. He wins his ladies hand and lives happily ever after. Rudolph Rassendyll couldn’t have said it better to Princess Flavia while freeing the prisoner in the castle of Zenda. Of course Vance couldn’t keep a good man down, and O’Rourke returned in a prequel detailing his adventures with Danny before his fateful meeting in Paris. 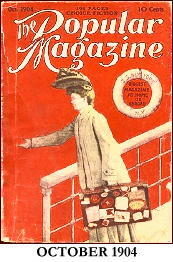 This was 1905 and only the Scarlet Pimpernel managed to keep adventuring after marriage. At least Beatrix was spared all those kidnappings suffered by Bulldog Drummond’s wife. The pleasures of O’Rourke’s adventures are many. Vance was a novelist before he was a pulpster, and his characters are fully developed human beings with believable motives, actions, and consequences for their actions. O’Rourke may be a pulp superman, but he is a believable superman, and his feats of heroism are just within the bounds of probability, and he is never better than when the odds are impossible and the moment is desperate. Terence O’Rourke, Gentleman Adventurer can be downloaded for free or read on-line at Google Books in PDF or EUPB format. A more detailed account of his life and adventures can be found in Robert Sampson’s Yesterday’ Faces: Violent Lives, Vol. 6 (Bowling Green University Press). O’Rourke was without food or water, without protection from the sun; he had nothing to depend on but this camel, his Mauser, and the high, bold heart of him. For us and O’Rourke that is enough. A sword, a gun, and the ‘high, bold heart of him.’ What more can an adventurer ask, even the armchair kind? The stories you list are the novellas that make up TERENCE O’ROURKE, GENTLEMAN ADVENTURER and THE FURTHER ADVENTURES OF TERENCE O’ROURKE collected in this book and as THE ROMANCE OF TERENCE O’ROURKE, GENTLEMAN ADVENTURER. In the book the stories are divided into chapters and thus have different titles in what used to be called a fix-up in sf circles — a group of short stories connected loosely and rewritten a bit as a ‘novel'(the first two Fu Manchu books were similar fix-ups). The four stories you list follow the “Empire of Illusion” sequence. There is a third group of stories set before “The Empire of Illusion,” but I don’t know if they were collected in book form. The serial was following closely by the stories I listed in my Editorial Comment, skipping only the July issue. The stories do not continue in the March issue, so I assume this group is complete. If there are stories before “The Empire of Illusion,” I haven’t come across them. 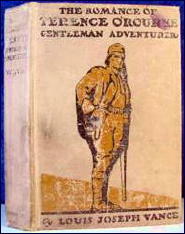 THE ROMANCE OF TERENCE O�ROURKE, GENTLEMAN ADVENTURER was published in book form by Bobbs Merrill in 1907. THE FURTHER ADVENTURES OF TERENCE O’ROURKE is the subtitle (I believe) of POOL OF FLAME (Dodd Mead, 1909). Can you specify which of the pulp stories made up each of these three books? Note that O’ROURKE, THE WANDERER was not published in book form under that name. Unless I’m mistaken, of course! The copy I have is the 1907 THE ROMANCE OF TERENCE O’ROURKE, GENTLEMAN ADVENTURER (Bobbs-Merrill) and consists of TERENCE O’ROURKE and THE FURTHER ADVENTURES OF … according to a Preface by Vance (dated 1905) at the beginning of the book. The first half is “The Empire of Illusion” and part two the four novellas you list in your editorial note. 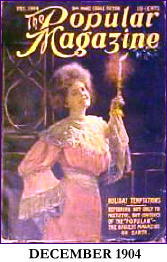 As far as I can tell ROMANCE is the first book publication of the material appearing in Popular Magazine as THE FURTHER ADVENTURES. THE POOL OF FLAME (1909) does not consist of any of the stories Vance includes in THE FURTHER ADVENTURES, but seems to be part of the WANDERER sequence or even an unrelated novel with O’Rourke. No magazine appearance is noted and the book reads as a single story seeming to take place before the stories in THE ROMANCE. Beatrix does not appear and is not mentioned. Between the first publication of TERENCE O’ROURKE (1904) and the 1909 POOL Vance had three major best sellers, THE BRASS BOWL, THE BLACK BAG, and THE BRONZE BELL. My guess would be POOL is a compilation of the WANDERER sequence, perhaps rewritten as a novel rather than just a fix-up like ROMANCE. As far as I can determine THE ROMANCE (07) and POOL (09) reprint the entire O’Rourke sequence from Popular Magazine. Both are available at GOOGLE BOOKS. Vance created the Lone Wolf in 1914 and wrote eight adventures featuring him from then until 1947. As far as I can determine his first book was 1904’s TERENCE O’ROURKE which may have consisted of “The Empire of Illusion” sequence alone. Thanks, David. This is all very useful. There are some questions I still have, but until we have the the magazines in hand so we can match the stories up with the etexts, we may have gotten as far as we can in terms of identifying which books consist of which stories as we’re going to get. Nonetheless, I think we’re awfully close. I wonder if Walker Martin still has a set of THE POPULAR MAGAZINE there on the shelves in his converted two-car garage, with aisles you can barely walk through. It’s one of Seven Wonders of the World either way, I hope everybody realizes, whether he does or doesn’t. Reading over THE POOL OF THE FLAME, I find Beatrix and a few of the characters from the earlier book are mentioned, never the less I believe it to be the book version of WANDERER, and the stories Sampson calls a prequel less that than a set of adventures taking place in some gap in the adventures that follow “Empire of Illusion” and before the final story published as “In Which O’Rourke Sheaths His Sword” in Popular. The book clearly takes place before the events in that last story, and since I doubt a book length section was left out of THE FURTHER ADVENTURES and this is not the material Vance calls THE FURTHER ADVENTURES in the Preface to ROMANCE I can only assume this is a fix up from the WANDERER sequence. Sorry for any confusion, but searching through a PDF is a matter of scrolling through pages without benefit of a simple search engine mostly. It’s not as if this is unknown. Rider Haggard killed off Allan Quartermain in the book ALLAN QUARTERMAIN and spent the rest of his career writing unrecorded adventures that took place before that event, and even Nicholas Freeling relented and gave us a ‘new’ Van der Valk long after killing him off. A good many writers found this a simple way to get around some problem with chronology. C. S. Forester first wrote the trilogy known as CAPTAIN HORATIO HORNBLOWER, and wrote three books following Hornblower’s later career (COMMODORE,LORD, and ADMIRAL)and four, with a fifth unfinished at his death, following the character from Midshipman to Captain. Some writers are so careless of continuity that a veritable cottage industry grows up around trying to put their characters adventures in some sort of order. Whole volumes have been written trying to tell when exactly certain tales in the Holmes canon took place. Heaven help anyone who ever tries to create a comprehensive chronology for Johnston McCulley’s Zorro, and the Scarlet Pimpernel saga went on to include tales of his distant ancestor and a contemporary descendant as well as stories that sometimes start before the first novel and end after it. And with apologies to all, since that last is the story in which Terence and Beatrix are finally united, that’s a pretty Freudian title — even for 1905. Steve asks about my CAVALIER set of pulps and would it be possible to build up another set. I�ve always believed collectors have to be moving on and expanding their interests. Once you reach your goal and complete your collection, then often the next step is you start to dismantle it. So I�ve always kept adding titles to collect. I really don�t understand collectors who can limit their collecting activities to one author or even one genre. I started out as a teenager collecting SF and this lasted until my mid twenties when I discovered detective pulps, thanks to Ron Goulart�s HARDBOILED DICKS anthology. I also picked up massive amounts of vintage paperbacks because back then they were so cheap. Then at the first Pulpcon in 1972 I discovered general fiction magazines like ARGOSY, ALL STORY, ADVENTURE, BLUEBOOK, SHORT STORIES, POPULAR. Around 1980 I added western pulps. Eventually I completed my sets or just about completed them, something I never thought would happen, and reached the point that I really didn�t need any major wants. Then I started to dispose of certain sets that I found I could no longer read. For instance, I found that the hero pulps and weird menace pulps were not that readable anymore. Also I finally reached the point that I had filled up a five bedroom house, including the basement, living room and family room, etc. My son�s room is the only holdout. I�ve been at this since the 1950�s and now I�ve run out of space and since I�m getting older, I�m running out of time. So I started disposing of things but once a collector, always a collector. It never ends until the end. So the CAVALIER set was one of the victims around 10 years ago. Since I filled the shelf space right away with other magazines, Steve probably never noticed they were gone. The reason I regret letting them go is because I still have my ALL STORY and ARGOSY sets and CAVALIER is all part of the Munsey chain of magazines. How hard would it be to replace? Just about impossible nowadays. I see I�ve turned this into a rambling essay, but collecting books, pulps, and vintage paperbacks, is something I�ve always felt passionate about. I won�t even get into original art or old movies. Now I have to leave because it�s 1:00 am and I have to get up at 5:00 am, but I want to squeeze in a Tim McCoy film, ACES AND EIGHTS. Just looking on eBay, I found maybe six CAVALIER pulp magazines from the teens, some combined with ALL-STORY, and even for beat up copies, the lowest asking price was $50. A lot of two others has reached just less than that, but that�s an auction, and both copies have Edgar Rice Burroughs stories in them, and I have a feeling the price is going to go quite a bit higher. Too bad I left my check book in my other pants. My take is that it is the sign of a vital mind that new things catch your attention. Or, in my case a bad case of collectors ADD. I have what I consider a basic collection, and then other things join it or get cut from it, but nothing to equal that library of yours. Not that you can navigate my garage either, but it has only a little to do with my collection — or as the cats call it, the cat gym. At least they don’t use it for other purposes. By the time I began to collect pulps the best you could do at antique and second hand stores was a few stray copies of ARGOSY or ALL STORY — generally in pretty poor condition. Cost was less a problem then with most pulps than availability, and invariably some serial I wanted to complete would end up with one installment in an issue with something that drove the price out of my range. Ah, well, I suppose the frustration is part of the experience. Not part of the pleasure though. I never was a big believer in delayed gratification. Re that NYTIMES review of the O’ROURKE, the Louis Tracy book compared to it is AN AMERICAN EMPEROR, and available at GOOGLE BOOKS for anyone who wants to compare the two. I still have my set of THE POPULAR MAGAZINE but I’m involved in so many reading projects at present that I can’t imagine myself delving into the O’ROURKE comparison of e-texts and magazine versions. That way lies insanity! However, this discussion has aroused my curiosity about Louis Tracy and why I haven’t read much of his work. So, at some future date, I’ll be reading some of his work in POPULAR. By the way, a truly excellent history of THE POPULAR MAGAZINE has recently been published in Ed Hulse’s magazine BLOOD N THUNDER. It’s a two part long overview that starts in the Summer 2009 issue. He spends some time on Louis Tracy and says the O’Rourke stories hold up remarkably well. By the way, I noticed that David is referring to me as “Walter”, which is a common mistake with my name. But it might lead to misunderstandings if collectors contact Walter Albert, etc. Maybe this is an example of David’s collector’s ADD? Steve, in comment number 7 refers to his previous review of ACES AND EIGHTS and how many of the actors started in the silent era. I noticed so many interesting things in this movie concerning the actors, though the film itself was mediocre. For instance Charles Stevens who plays the ridiculous looking Mexican Captain, was half Mexican and half Apache and was the grandson of Geronimo. He was in around 200 movies. But just about all the main actors in this film had extensive movie careers. Jimmy Aubrey, who plays Tim McCoy’s sidekick, was born in England and sounded it. He was in almost 500 movies. Before the days of IMDB.com, this interesting information, even allowing for the usual mistakes and errors, would not have been available for us to ponder. My apologies on the name. Mea culpa. Though it is less the ADD than needing to clean my glasses or turn up the background light on the laptop. Thanks for the info on the historical background of the two books. That explains some of the similarities. Tracy is an interesting writer with quite a few adventure tales, some early sf, and mysteries including those about Inspector Furneaux with M. P. Shiel as Tracy, Gordon Holmes, and Robert Fraser, and those about attractive barrister and amateur sleuth Reginald Brett. As you know better than most of us POPULAR had a considerable lineup of talent and names gracing its pages. I look forward to the BLOOD & THUNDER articles, thanks for the tip. I agree about ACES AND EIGHTS though I generally like Tim McCoy’s films. As for the number of films some actors did you have to wonder what the record is. With some actors careers spanning from the silent era into the sixties (and beyond in some cases)you know some actors built up considerable portfolios.